This isn't any ordinary grilled cheese sandwich - our Philly-Style Grilled Cheese has big flavour for the big kid in you. 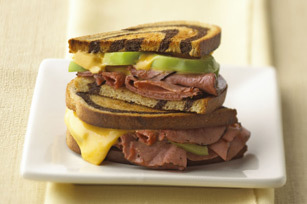 Made with marble rye bread, KRAFT SINGLES, deli roast beef and green peppers, this grilled cheese sandwich is sure to become a lunch favourite. Heat small skillet sprayed with cooking spray on medium heat. Cook 3 min. on each side or until golden brown on both sides. Round out the meal with assorted cut-up fresh vegetables and a piece of fruit. Serve with a crisp Claussen Dill Pickle on the side.